Jupiter hasapparently been smacked again by a rogue object hurtling through space, new imagesfrom amateur astronomers and NASA reveal. A giantscar-like blemish has appeared in the clouds near Jupiter?s south polar region,which NASA observed in infrared after receiving a tip from an amateurskywatcher in Australia. The likely impact appears to have occurred exactly 15years after the remnants of Comet Shoemaker-Levy 9 bombardedthe planet in 1994 in an event that was widely predicted and scrutinized asit happened. The latestimpact was not predicted, and it was caught by chance. ?We were extremely lucky tobe seeing Jupiter at exactly the right time, the right hour, the right side ofJupiter to witness the event,? said Glenn Orton, a scientist at NASA?s JetPropulsion Laboratory in Pasadena, Calif., in a statement. ?We couldn?t haveplanned it better.? Orton and his colleaguesused JPL?s Infrared Telescope Facility atop Mauna Kea in Hawaii to collectevidence of the impact. The initial call came from Anthony Wesley of Murrumbateman,Australia, who told NASA he noticed a new dark ?scar? suddenly appear onJupiter early Friday between 6 a.m. and 12 p.m. EDT (1000 and 1600 GMT). In anobservation report posted to his Web site, Wesley said he almost missedspotting Jupiter?s new blemish entirely because he was tired after a late-nightskywatching session. ?It was avery near thing,? he wrote, adding that by 1 a.m. Local Time, he decided at thelast minute to keep observing for another half hour. 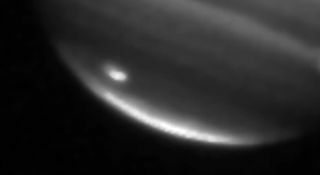 ?I'dnoticed a dark spot rotating into view in Jupiter?s south polar region and wasstarting to get curious,? Wesley went on. ?When first seen close to the limb(and in poor conditions) it was only a vaguely dark spot, I thought likely tobe just a normal dark polar storm. However as it rotated further into view, andthe conditions also improved, I suddenly realized that it wasn't just dark, itwas black in all channels, meaning it was truly a black spot.? The spot,Wesley added, was moving too slow to be a moon and his previous observationsfrom two days earlier showed a pristine, spotless Jupiter. A short while later,he decided to begin contacting people to spread the news of his find. Orton andhis team haven?t stopped tracking Jupiter, which is a gas giant and the largestplanet in the solar system. Thenear-infrared image collected by his team revealed the odd blemish, whichappeared to have a bright center, and what looked like debris to the northwestof the likely impact site. ?It could be the impact ofa comet, but we don?t know for sure yet,? Orton said. ?It?s been awhirlwind of a day, and this on the anniversary of the Shoemaker-Levy 9 and Apolloanniversaries is amazing.? Other skywatchers have also been tracking the apparent Jovianimpact. Lars Zielke, a skywatcher based in Tvis, Denmark, spotted the tell-talescar to much excitement. "My camera showed the spot clearly and I was lucky toget at great sequence with the dark spot and Io passing by,? he told SPACE.com. ?I was so thrilled that I didn't stop in time, so I missed the first hours ofwork this morning." BetweenJuly 16 and July 22 in 1994, Comet Shoemaker-Levy 9 was tornapart by Jupiter?s gravity as it swung past the planet. The remainingpieces crashed into the planet while astronomers looked on with telescopes onEarth and in space.? It was thefirst collision of two objects within the solar system in ever observed fromEarth. The impactswere cataclysmic. More than 20 fragments - some as large as 1.2 miles (2 km)across - slammed into Jupiter at 134,200 mph (215,973 kph) as the planetrotated, sending plumes of hot gas into the Jovian atmosphere and causing darkscars that lasted for weeks. A similarimpact on Earth would cause widespread devastation on a global scale. SPACE.com Senior Writer Andrea Thompson contributed to this report from New York City.